In the early days of the Cat Fancy at least, pedigreed bi-colour and parti-coloured cats were often treated as the 'poor cousins' of their solid coloured counterparts, and when they appeared in litters (often from dominant white cats masking the white spotting gene), they were generally discarded as pets. But a few stalwart breeders did persist with them and loved them. A similar situation existed in the United States, but they tended to fair better in America, where they were more popular with the general public, than they did back in Britain. It was not until the late 1940's, when Norah Woodifield of the 'Pathfinders' cattery took up the challenge of combining good Persian type with good patterning, that they truly began to obtain a foothold in Britain, and over the next three decades, from her many exports, in other countries around the world. In many respects, in these early days, it was the shorthaired bi-colour and parti-coloured cats which got the earliest recognition and which more readily reached the prize list at shows. Bi-colours tended to fair better in America. Despite this, a few truly dedicated breeders from the very earliest period, did attempt to promote the bi-colours within the fancy at large. Some of the early examples of bi-colours which were shown included the likes of Miss Wheatley's 'Taffy' (a Cream and White), Dr. R. S. Huidekoper's "Mustapha' (a Blue Tabby and White), Miss Ava Pollard's "Uncus" (a Black and White), and Mrs. Weed's 'Juno' (a Brown Tabby and White), to mention but a few. "This is a variety of long hair cat I should like to see increase in numbers. They are so scarce that shows never give a class for them, thus making things difficult for anyone trying to work the breed up. At present, black and whites have to be entered in the 'Any Other Colour' Class. "A jet-black glossy coat, with perfectly white feet, white chest and throat, and with the correct three corner blaze on the face, is the description. But until some breeders devote themselves to improving and increasing this variety, and endeavour to breed a male and keep it as a stud, we shall never have a club or a class for them. I feel sure that if this were done the breed would be a most popular one. 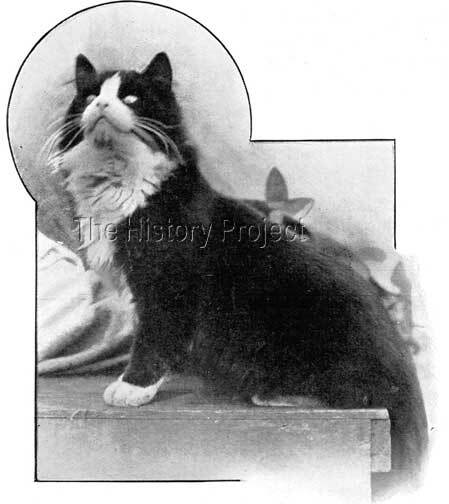 'Prince Colburn' was bred by Mrs. Clinton Locke of Chicago, and is registered in the Beresford Cat Club Stud-book under his last given name and owner, which was as 'Riverside Prince Colburn', owned by Miss Cora Wallace, of East Brady, Pennsylvania. However he started life as 'Lockehaven Prince Colburn' and was originally named in honour of his first owner, Mrs. W. Eames Colburn, of Chicago. His registration number is recorded as 384 and on the registration he is described as a 'Black, perfect white markings'. His sire was 'Elton II', a dominant solid white male, and his dam was a lovely solid blue female, owned and bred by Mrs. Locke, named 'Rosalys II'. From his dam, he inherited the bloodlines of his English bred grandparents, 'Ch. The Beadle' and the lovely 'Rosalys'. It is likely that the birth of a perfectly marked Bi-Colour would have come as a surprise, as in those days, nothing was known about the masking effect of dominant white, and therefore, the breeder would not necessarily have known that the white spotting factor had been inherited from his sire. But the fact that this kitten was so well marked, would have been a good compensation! 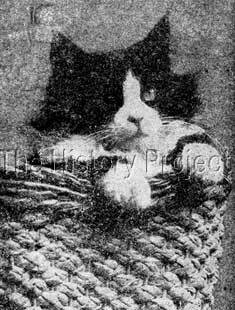 Due to correctness of his pattern, 'Prince Colburn' went on to feature in both of the book by Helen Winslow, Concerning Cats published in 1900, and Frances Simpson's The Book of the Cat, published by Cassell's, in 1903. Unfortunately, 'Riverside Prince Colburn's' registration (BCC 384), does not go so far as to supply us with a date of birth. He does however, have a fully registered sibling, from exactly the same parentage named 'Prairie-Rose Roscoe' (BCC 118), who date of birth is 26th October, 1898. So, in this instance we have taken artistic license and assumed at this point, that they were litter brothers. 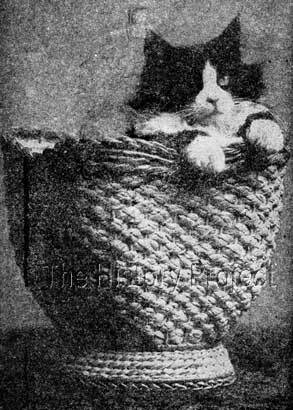 It would certainly seem to fit, as the first photo of 'Prince Colburn' as a kitten appears in Helen Winslow's Concerning Cats, published in 1900, and in the very same publication is the photo of him as a fully developed adult, which later also appeared in Frances Simpson's The Book of The Cat. 'Lockehaven Lord Argent' with 'Lockehaven Prince Colburn' as developing kittens. Another clue is that included in this photo of him is a youngish looking 'Lockehaven Lord Argent', a Smoke, (BCC 127) whom we know was born in July 1897! So this means that he had to have been born somewhere between mid to late 1897, at the very earliest, or in 1898 as we have surmised. There are currently no records extant of his show wins, although it is likely that he was shown in Chicago with the Beresford Cat Club, long before leaving for Pennsylvania. Only one record can be found of any progeny from 'Prince Colburn', and that is for a Black female, named 'Lady Raven' (BCC 785), sired by 'Prince Colburn' and out of 'Cricket'. 'Lady Raven' was bred by the owner of 'Prince Colburn', Miss Cora Wallace, and owned by J.C. Moore of Pittsburg, PA. Her dam, 'Cricket', combined the lines of the famous black,' King Max' (her sire), and Mrs. Clinton Locke's two imports, 'Ch. Beadle' and 'Rosalys', who produced her dam, 'Rosebud'. In summary, 'Prince Colburn' was an early herald of what was to come. In time, a growing interest in bi-colours arose, where an inverted 'V' on the face and/or 'Dutch Rabbit markings' generally began to prevail as the desirable traits in show specimens. And, as this occurred, these varieties slowly but surely gained acceptance and took hold. Little could they have known then, that in less than 90 years, Bi-Colour Persians would successfully compete both nationally and internationally, and from their ranks many a 'Cat of the Year' would be found.